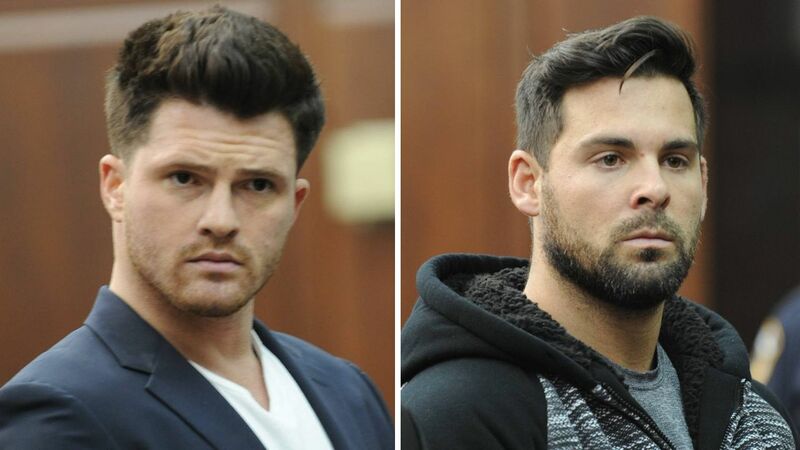 James Rackover (left) and Lawrence Dilione (right) were arraigned in a Manhattan courtroom. UPPER EAST SIDE, Manhattan (WABC) -- One of the suspects charged in connection with the death of a Connecticut man on the Upper East Side is due back in court Monday. 25-year-old Lawrence Dilione goes before a judge for a control date. He was indicted last month in connection with the death of Joseph Comunale. James Rackoover, 25, is facing the same charges and will be back in court next week. Neither has been charged with Comunale's murder but the investigation is continuing. The two were arrested last month and arraigned on charges of concealing a corpse, tampering with evidence, and hindering prosecution. Dilione and Rackover waived their appearances at a hearing in November and no new charges were added for either defendant. Prosecutors say Comunale had been stabbed 15 times before being buried in a shallow grave in Oceanport, New Jersey. Comunale's father reported his son missing because he had not heard from him. Police went to the place where Comunale was last seen -- an Upper East Side apartment. That's where police found evidence of foul play, recovering about 32 pieces of evidence.